I played Troll and I so that you don’t have to. It’s never particularly enjoyable to rag on a game as a critic, but this perilous adventure in the Nordic wilderness is memorable for all the wrong reasons. It opens with Nico Dioli being hired to capture a troll that has been sighted in Scandinavia, a search that, for some reason, takes them five years to discover where it is roughly located. With Troll desperately looking to escape the hunters that have been paid to capture him alive, he soon befriends a young teenage boy called Otto who fled his home after it was burned to the ground to force the mythical creature out from hiding. It’s clear that above all else developer Spiral House wanted Troll and I to be a meaningful experience, a heartfelt adventure that would explore the unbreakable bond between two characters that are both struggling to survive. Sadly, the plot is so poorly scripted and laughable in execution that it is hard to ever find yourself caring about what happens. It is not hard to come up with a prime example, either. There is a scene early on when Otto comes face-to-face with a hunter for the first time, an encounter that results in a struggle that sees him plunge a knife into the hunter’s chest to kill him outright. Reacting in complete shock, Otto shows immediate remorse for his actions and mutters a monologue where he blames the hunter in forcing him to do it. Despite Otto’s cringe-inducingly wooden voice acting it attempts to be a poignant moment, only to be ruined seconds later when the developer prompts the player to stealthily sneak toward another hunter to slit his throat. To me that perfectly sums up Troll and I, a game that is in constant conflict with what it wants to achieve. That largely comes from sheer boredom, Troll and I so readily suffering from being a game that longs to impress the player with how clever it tries to be, but tragically forgets how important it is to get the basics right. For all the effort that has been put in, it simply isn’t enjoyable at its beating core. It’s a real shame because there is plenty of promise to be seen in the choice to have two characters that you can freely switch between. Troll and Otto must regularly work together to overcome the obstacles that they face, which sees them tread different paths to resolve the situations that they find themselves in. More often than not that sees Otto scamper away to dislodge rocks, dismantle troll traps, or simply climbing up on to Troll’s shoulder so that the lumbering creature can place him on or carry him across the otherwise untraversable terrain. 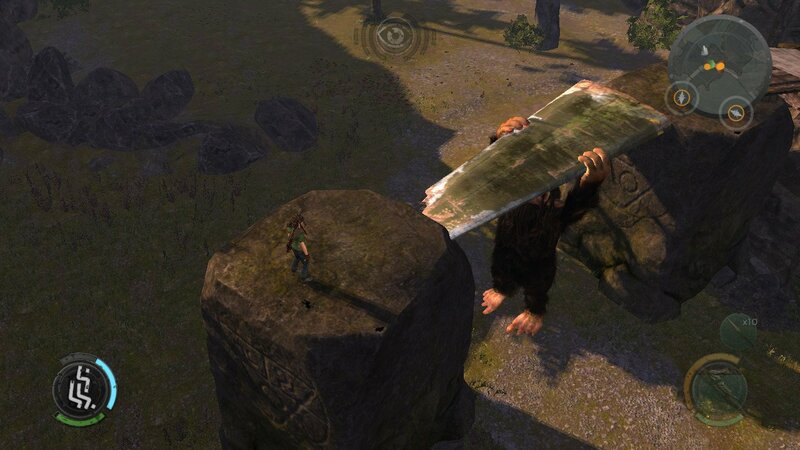 Troll is also called upon to create makeshift ledges with a plane wing, rotate a doorway mechanism, and smash gates open, so he still serves a purpose. If there is some small success that Troll and I can celebrate this is it, even if it has been done better elsewhere. But, what really hampers the experience is how needlessly bloated it feels. Whether that is the unnecessary skill and ability upgrades that don’t appear to have much impact, an infrequently needed stealth system, weapon durability to keep in mind when striking enemies, or the crafting system that only ever really requires that you create spearheads tipped with coloured shards as a means to destroy sorcerous rubble that blocks your path, collectively they over-complicate a game that would have benefitted from a more streamlined direction. That becomes all the more evident in combat situations, that largely happen when you stumble upon a fracture. 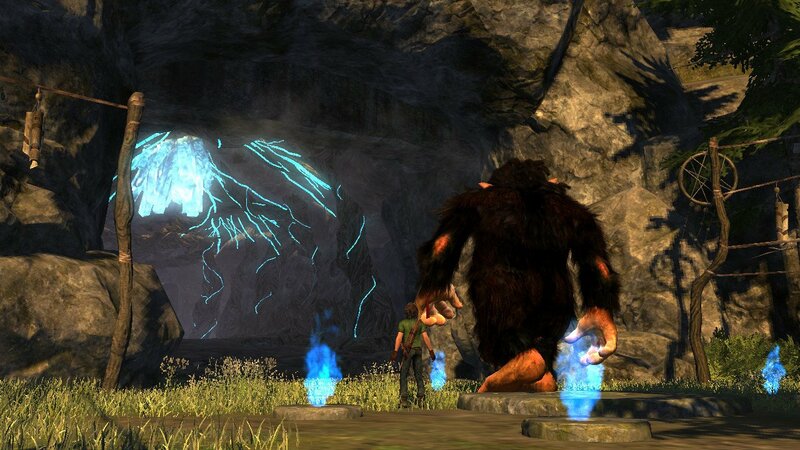 These are used by the ahky – which are the goblin-like enemies in the game – to invade Otto’s world, and, while Troll can close them all by hurling a rock at them, the player is left to mop-up any enemies that emerge from their depths. 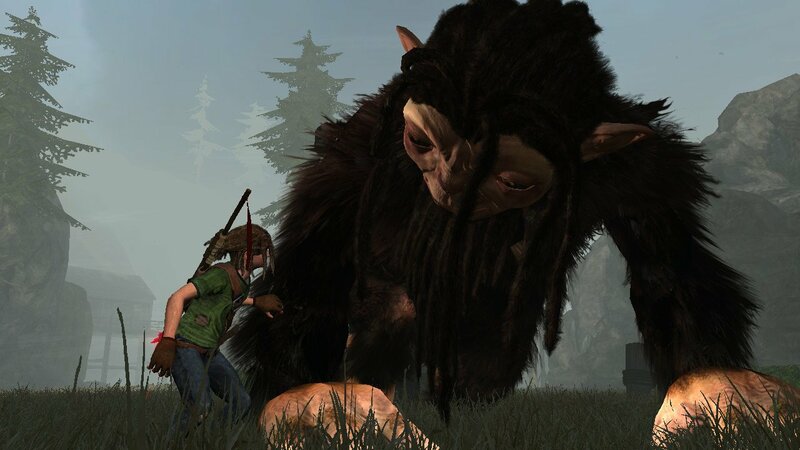 Why they are spawning in our world is never even explained, with the emphasis repeatedly placed on the hunters that swarm the Nordic wilderness rather than exploring the, potentially far more interesting, lore around Troll. With Otto, you can choose to attack with crudely made melee weapons or at long-range with spears. But, his role is largely made to look ineffective when you realise that you can use Troll to bellow at enemies to stun them to then kill them with one stomp or ground pound. The developer attempts to overcome this imbalance through instances where Otto will need to travel separately from Troll, the only time when you will want to craft stronger weapons. You will want to change up your weapons from time to time, in any case, seeing as how repetitive the basic animation will soon become – even if the finishing moves can be somewhat brutal. Enemies become more varied and tougher as you progress further into the game, whether that come in becoming more evasive to attacks, using more potent weapons against you, or suiting up with armour. If anything, though, combat quickly becomes an irritation that stalls your adventure, which is troublesome seeing as how frequently it happens. That’s more apparent in the eventual boss fight that you face, which, unsurprisingly, comes out of nowhere with little explanation. With Troll and Otto both required to break the monster’s armour off, this battle is more about resource management than any deft skill. Rocks hurled at you in the background as Otto wanders off to shape branches and carve crystal shards, it’s the clearest reason as to why there is such a disconnect between the player and the story that unfolds. It is the technical performance that significantly lets down Troll and I, lacking spit and polish across the board. It is peppered with inconsistencies, like glitchy animations, framerate drops, audio issues, icons that miraculously disappear, and unresponsive menus – made all the more surprising seeing as it uses such low-quality assets. The much touted major patch certainly goes some way to address criticisms directed at the game’s earlier release on other platforms – the mini-map, in particular, being invaluable in pointing you in the right direction on your adventure. But, general quality concerns are still prevalent. Rough around the edges, Troll and I ends with as laughable a moment as it starts – even having the cruelty to leave your adventures in the Nordic wilderness open to a sequel. Spiral House has longed for the stars to align to allow them a chance to work on a game built from their own ideas. Let us hope that this nightmare has now ended, and they can find something far better to dream about.